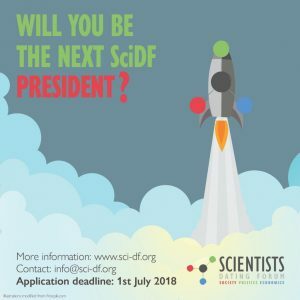 The association Scientists Dating Forum (SciDF) is looking for a new president. It is an exciting and challenging opportunity to, together with a diverse and motivated team, take part in developing and positioning SciDF inside the regional science ecosystem. Application Deadline: 1st July 2018. SciDF aims at strengthening the interactions between science and politics, society and economics. Its actions involve fostering debate and engagement of the different actors. Therefore, SciDF regularly organises round table discussions in bars (SciDF@Bars), trainings/workshops at scientific institutes (SciDF Talks), social activities for scientists (SciDF4Fun) and collaboration with existing entities and programs (SciDF Co-Lab). The two initiatives March for Science Barcelona 2017 and 21D #TambéVotemCiència, which raised major public attention, were led by SciDF. The organisation has significantly contributed to community building of the scientific sector in Barcelona. Since its creation in 2016, 70 young and dynamic professionals from over 50 entities have been involved in the team. Furthermore over 2000 persons have attended SciDF events so far. Strong Leadership and Communication Skills toward the team and the public as well as an interest in collaboration with entities and people related to SciDF are considered key in the fulfillement of this role. Detailed information to this position can be found online or contact them by mail.